What a wonderful power vacations have. In all honesty, if it were up to me, I would do nothing on vacation. Not a single thing. I’d sleep in until noon (what a wonderful concept) and do zero. Nada. Nothing. My recent vacation was very much like that. I swam, got tan, drank margaritas and spent time with my favorite family. 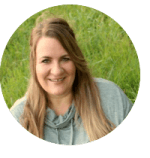 I don’t know how she did it, but my mom somehow convinced all of us to forgo the blissful act of doing nothing and actually leave the vacation house for one activity (did I mention how much I LOVED the vacation home?) It was towards the end of vacation, so I guess it was acceptable but if I’m being honest with you, and of course I am, this activity was the very last thing I wanted to do. I had become lazy and unmotivated from the week of complete and utter relaxation and wanted nothing more to do than stay in my bikini, in the pool, at our beautiful house. But, I went. I went because I knew I needed to experience it and because if I were to die I wouldn’t have to return to work on Monday. It was clearly a win-win situation. 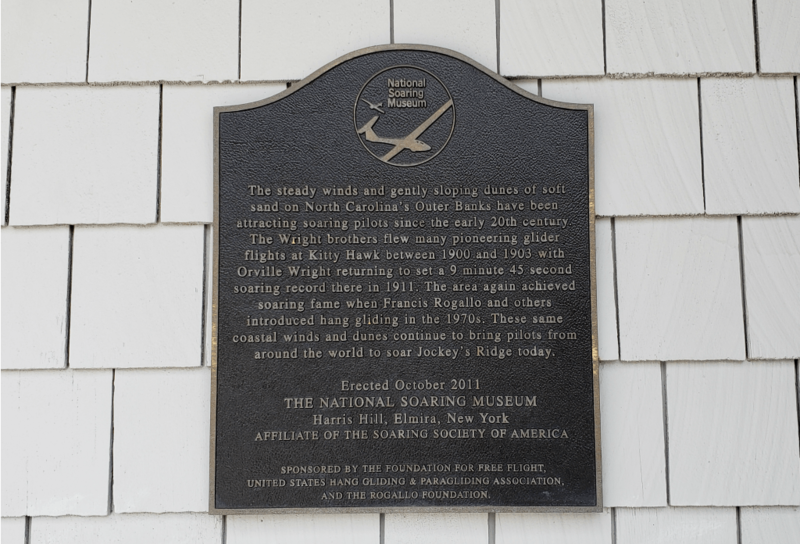 Like I mentioned in the post I wrote last year about my surfing experience with Kitty Hawk Kites, I don’t typically say no to anything. I like adventures. This was no exception. The first course of action for Flight School is to watch a video to learn what we needed to do and how we needed to position ourselves. 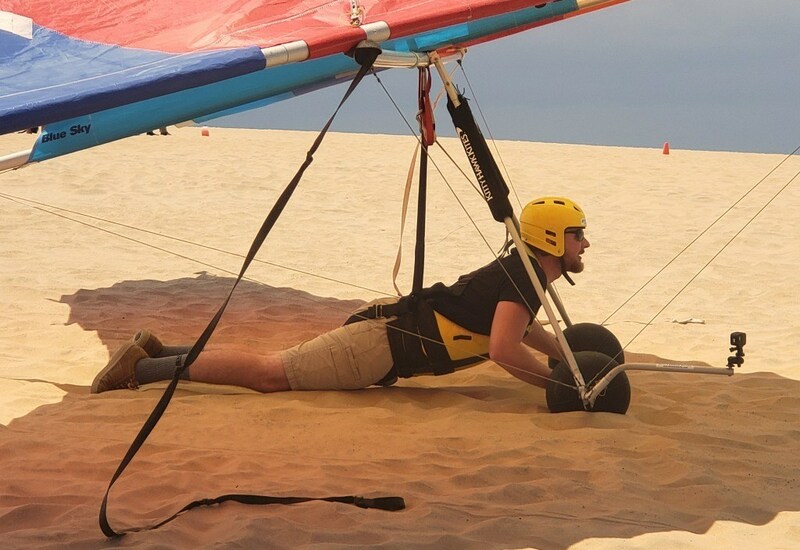 Then we headed outdoors, donned our hang gliding helmet and geared up, which boosted our attractiveness to solid -5’s. 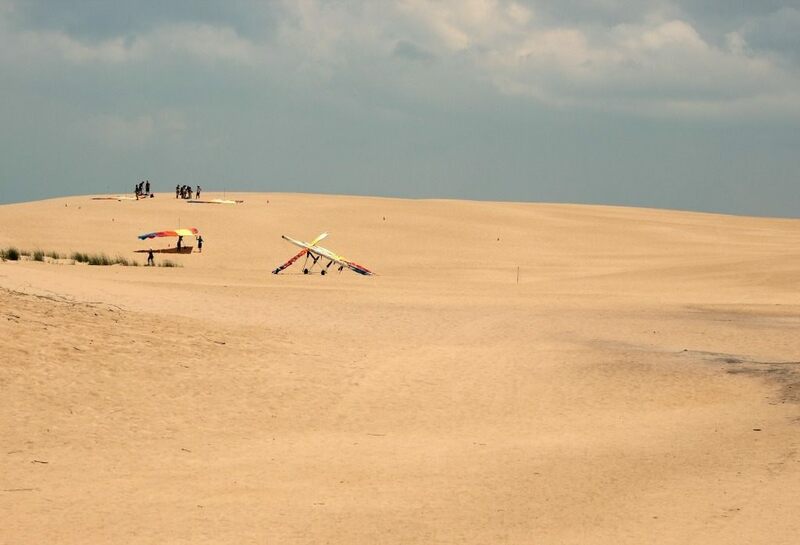 From there, we made our way to the hang gliding course on the dunes. It was time to fly. I’m not gonna lie. 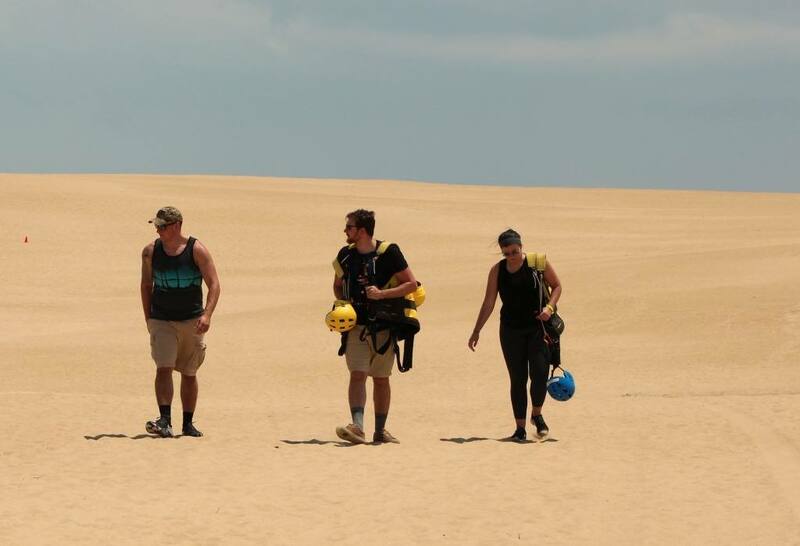 Climbing up the dune was killer. 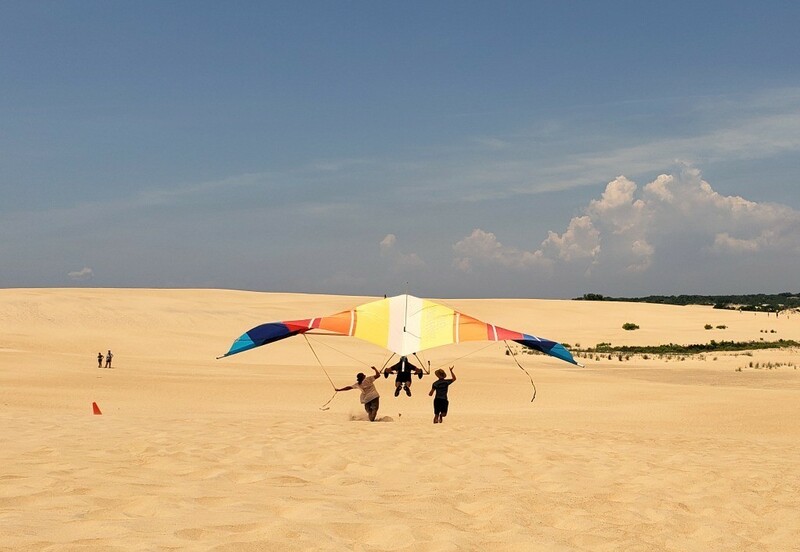 After walking up once, I dreaded the thought of walking up that dune multiple times. But, I survived and can honestly say it was all worth it. 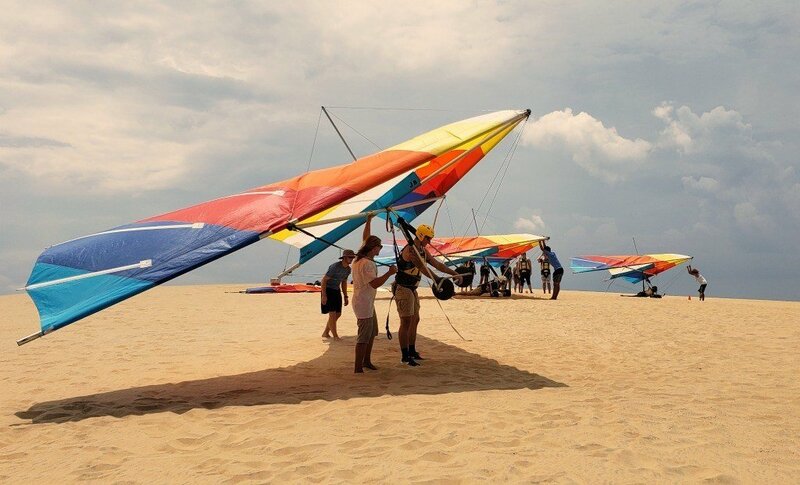 Once I got past the fact that I was terrible at hang gliding and pretty much everyone else was too, it was SO fun! 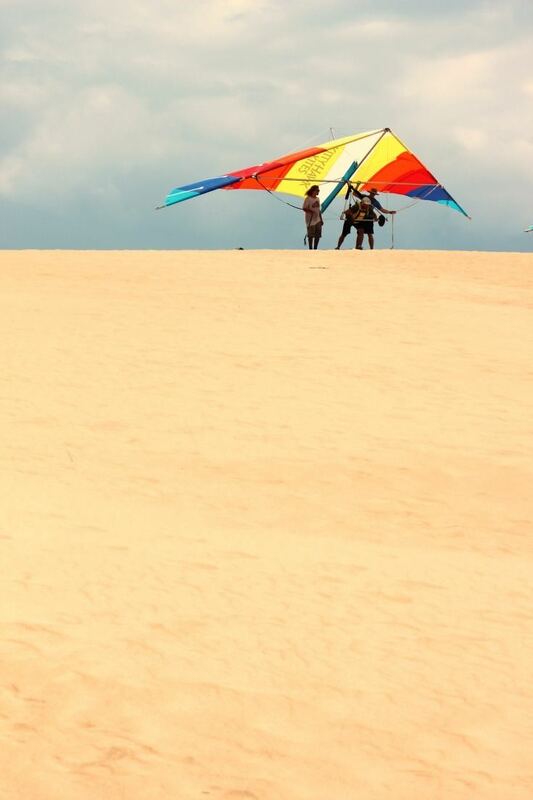 We flew down the dune a total of 5 times, which I feel is a solid amount of time. 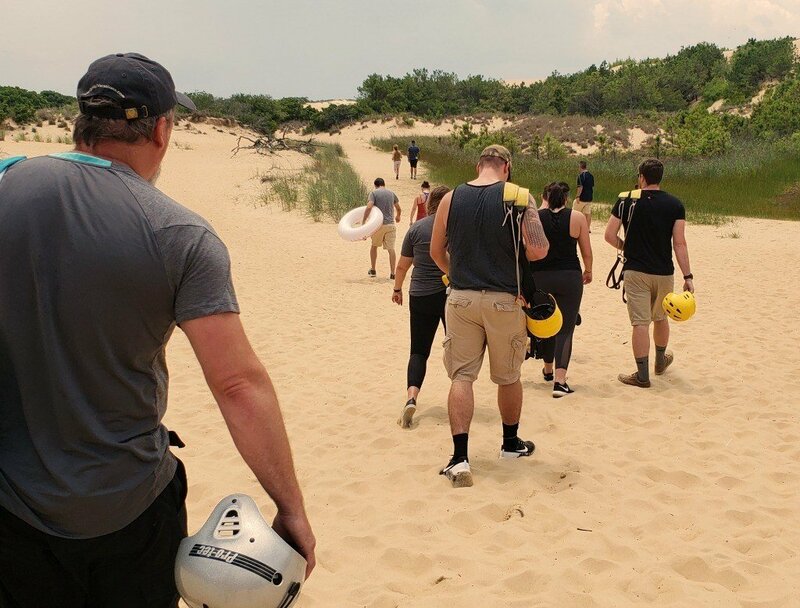 It was enough to realize we sucked, enough to realize what we were doing wrong, and enough to realize I should hit more cardio machines and fewer weights at the gym. The first flight down (if you can even call it that) was pretty bad across the board. Nobody really made it very far, which had its perks since we didn’t really have far to walk to get back up to the top of the dune! but after that, every flight felt more and more comfortable. 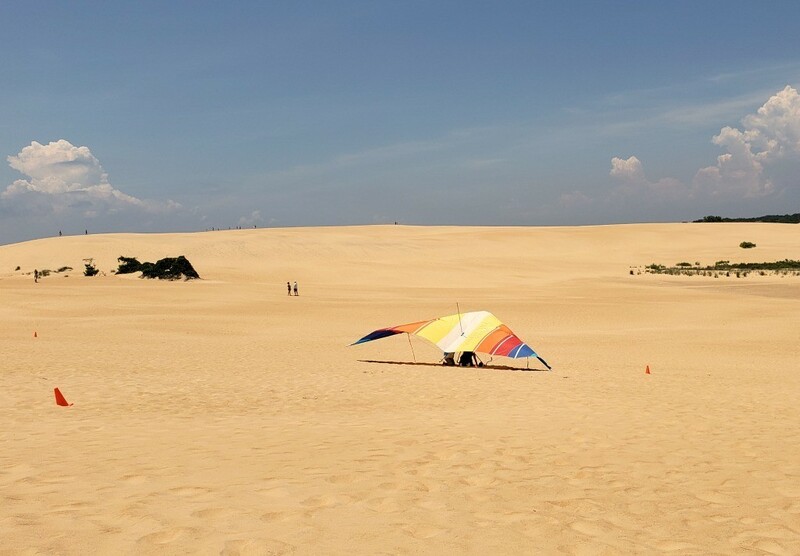 I can’t claim to be a pro by the end of the hang gliding lesson, that’s for sure, but I was no longer afraid of going face first in the sand. 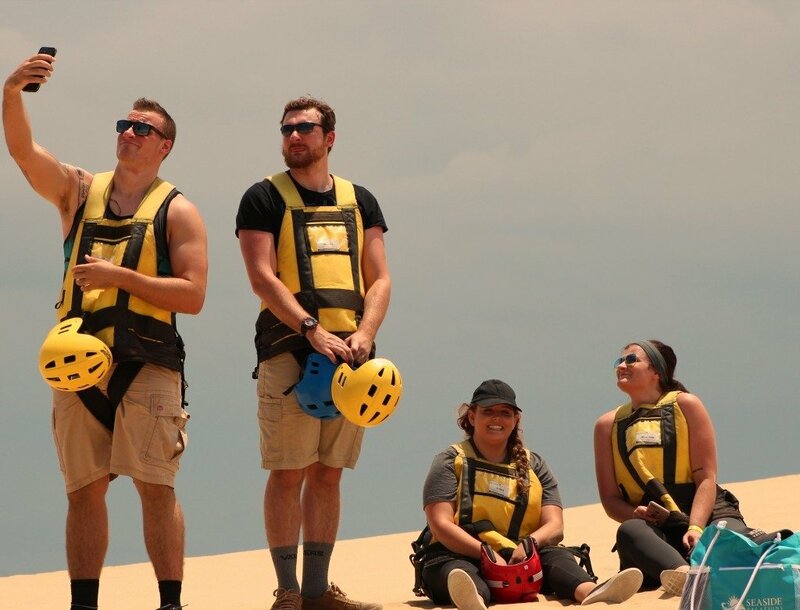 I can probably speak for everyone in my family by saying we would absolutely do this again (except for Livea, she would definitely NOT do it again unless it was much cooler outside). 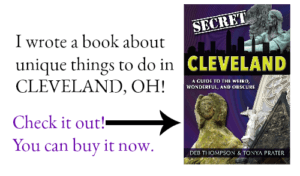 Buy sand socks (affiliate link) and skip the shoes. 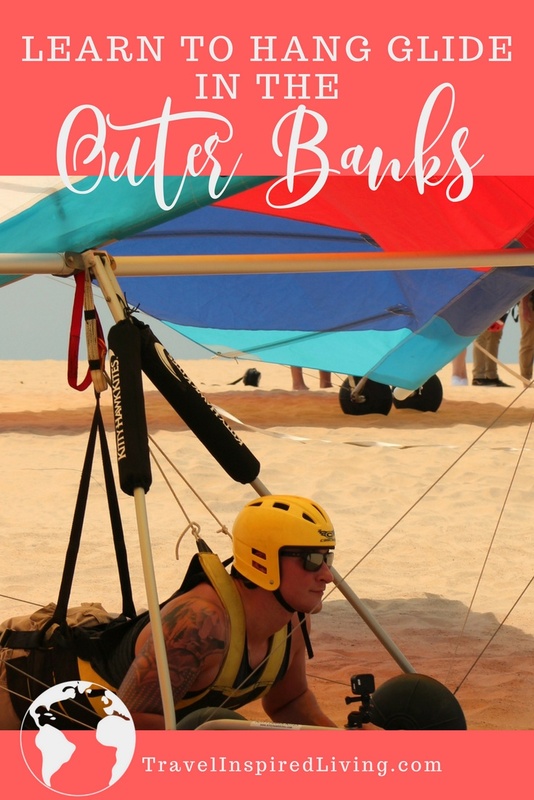 It will keep your feet from burning, allow greater ease when running in the sand, and save you from trying to get all the sand out of your tennis shoes later. 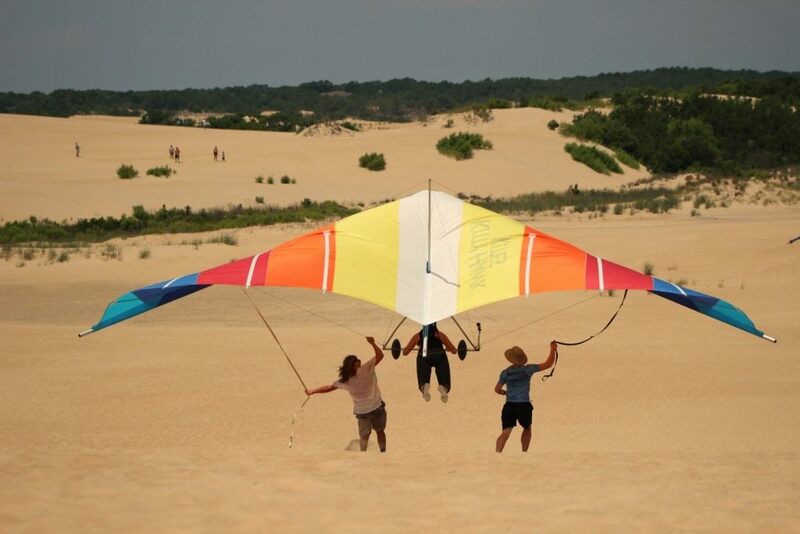 Kitty Hawk Kites offers several lessons including hang gliding for beginners and they provide all the hang gliding equipment you’ll need. 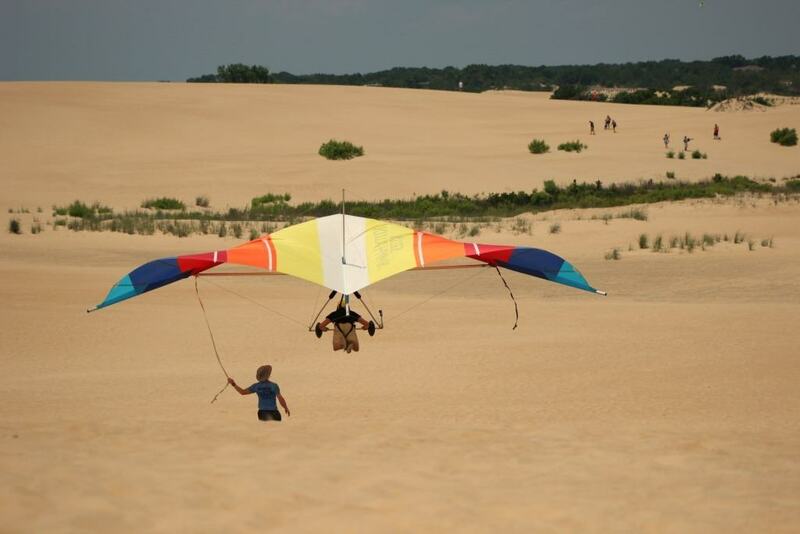 To find out how old you have to be to hang glide, how much does it cost to hang glide and for more information on Kitty Hawk Kites Hang Gliding and hang gliding Nags Head dunes at Jockey’s Ridge, visit this website. 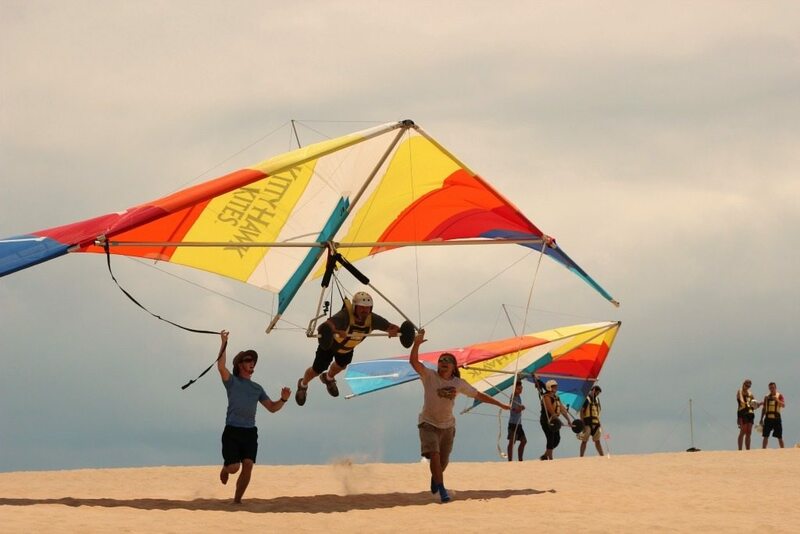 Kitty Hawk Kites is also an Official Seaside Vacations sponsor which means guests of Seaside Vacations can receive discounts on hang gliding lessons, kayaking and more. 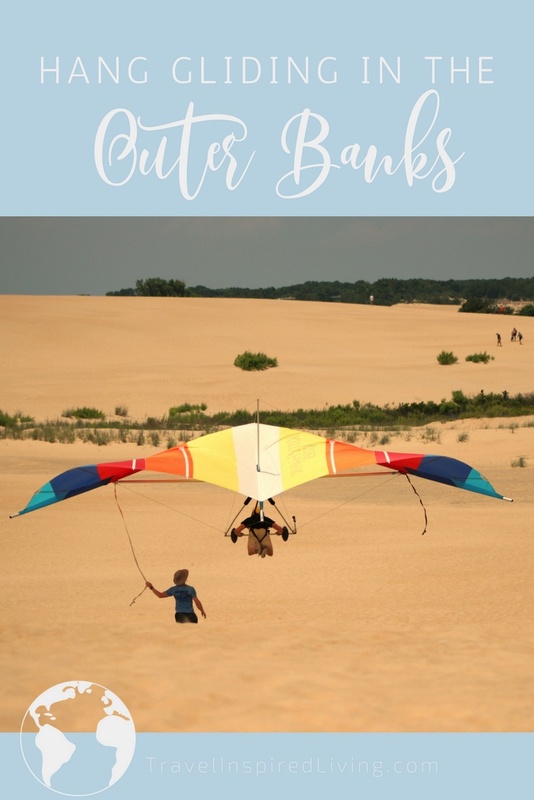 Read Seaside Vacations: Vacation Rentals in the Outer Banks to see how awesome our vacation home was and learn how you can save 15% when you book your rental home through Seaside Vacations. 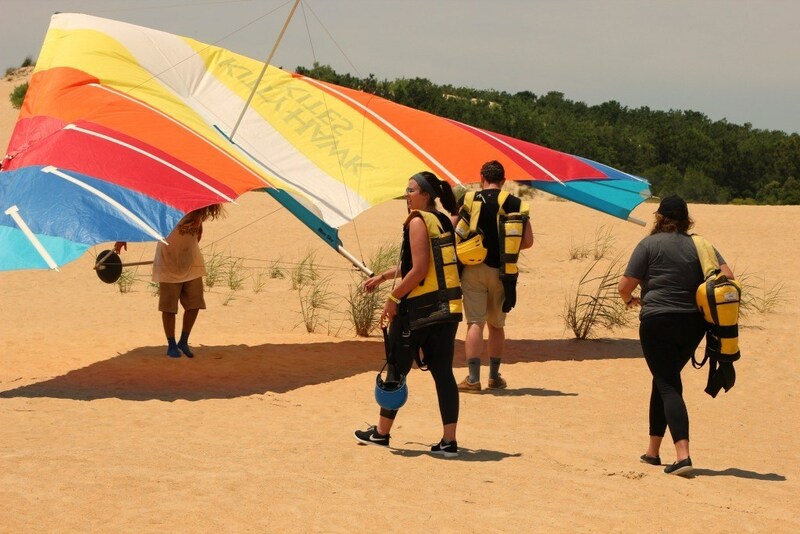 Shout out to the Outer Banks for arranging our visit and to Nolan and Charlie at Kitty Hawk Flight School for helping us to conquer our fears and feel somewhat competent, even if we truly aren’t. © 2018, Chelsea. All rights reserved.